One question we get here at Aperion Audio frequently is whether it is worth it to bi-amp your speakers. This blog will take a look at bi-amp benefits as well as a look at the different possible configurations and how to bi-amp your speakers. Back in 2010 when we launched our Verus line of speakers one feature we made sure to include were two sets of binding posts so our customers could bi-amp their speakers if they choose. One reason we made that move was because it was a very commonly requested item among our more audiophile leaning Aperion family members. To be clear, Aperion does not believe that you must bi-amp our Verus speakers in order for them to sound incredible. Our speakers are not very power hungry and they can definitely perform spectacularly with just a traditional positive and negative speaker wire hook up from a single channel. 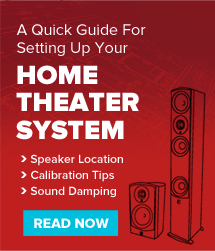 However, the fact is that many folks only have a 5.1 setup and almost every home theater receiver has seven channels of amplification (or more). So why not use those extra two channels to bi-amp? First, let’s back up a bit and take a look at what exactly we mean by bi-amping. Bi-amping is running two sets of wires, two positive and two negative for a total of four conductors from two separate amplifier channels to two separate sets of binding posts on each speaker. So if you only have the usual one set of binding posts, one positive and one negative, then you will not be able to bi-amp your speakers. Why two sets of binding posts? Because those two sets of binding posts will power different drivers in the speaker, typically one set will power the high frequency and/or midrange drivers and the other will power the woofer/bass driver(s). In the case of our Verus II Grand Towers, the top set of posts power the tweeter and two midrange drivers and the bottom set of binding posts power the two lower woofers. Keep in mind, if you do want to bi-amp your speakers make sure to remove the jumpers between the two sets of binding posts so the there is no longer any connection between them. One other thing, you will want to use the same gauge and roughly equal length wire runs for all eight conductors. If there is slight variance of a few inches in the lengths, that’s not a problem. Bi-amping should not be confused with bi-wiring, which is also running two sets of wires to the speakers’ two sets of binding posts, but in this case the wires for each speaker are all running off of a single amplifier channel. So there will be two conductors coming off the positive and negative terminal of that amplifier. Since the power from the amp hasn’t changed, really all you are doing is increasing the gauge of the wire since you now have more wires going from the amp to the speaker.This can result in lower impedance, but if you are using an appropriate thick wire gauge to begin with, such as 12 gauge, then there won’t really be much of a difference. Think about it this way, if you imagine that the power from your amp is water and the wires are pipes, it really doesn’t matter if you increase the size of the pipe if there isn’t enough water (or power) to fill it. You can also read a highly technical look at bi-wiring over at Audioholics here. So What’s the Deal with Bi-Amping? With bi-amping you really are doubling the total power to your speakers since you are using two separate channels for each set of binding posts. Since you are providing your speakers with more power, the benefits you can realize are an increase in overall output, less chance of blowing drivers through underpowering, more amp headroom for a cleaner and fuller sound, more bass extension from woofers which are more power hungry. So essentially, bi-amping is way to increase the power delivered to your speakers with your existing receiver or amp without going out and buying a more expensive one. Another thing to consider is that you have also increased the efficiency of your speakers because you split the crossover network and you are no longer wasting power that will end up being filtered out to prevent your tweeter from producing low frequencies and your woofer from producing high frequencies. There are actually a few different ways to bi-amp your speakers. Passive bi-amping is what I described before, merely hooking up two channels from your amplifier to each speaker. However, the consensus is the most effective and pronounced way to go is to actively bi-amp. In this type of bi-amping the crossovers are active and split the signal into high and low frequencies before it goes to the amplifier and then from there the signal goes to the speakers. However, in this scenario the speaker’s internal crossover network will be completely bypassed. Which means the active crossover needs to do a better job, or at least equivalent, than the speaker’s own crossover which was specifically designed for that particular speaker’s drivers and cabinet. Unless you are an experienced speaker engineer, or your active crossovers were designed by one who has knowledge of the speaker you’ll be hooking it up to, it’s not terribly likely that you will be able to improve performance. If anything, the chances are you’ll now be providing a less than optimal frequency range to the speaker’s drivers. But if you have the skill to get it right, the result can indeed be a marked improvement in terms of the frequency range, power and integration of the drivers. In short, if you go this route, good luck, I hope you know what you’re doing. There are also two extra types of bi-amping that can be used in either a passive or active setup. Vertical bi-amping is when two separate amplifiers are used for each channel that you send to the speaker. This can be an advantage, because you can use a more powerful amp for the more power hungry woofers and then an amp with less power for the tweeter. Just keep in mind you’ll need to do more tweaking with this setup to make sure the levels are matched between the two sets of drivers. Horizontal bi-amping is simply running two channels off the same amp or receiver. The scenario of using surround back channels to bi-amp is an example of horizontal bi-amping and this is probably the most common method since it doesn’t require the purchase of an extra amp. If you hook up your speakers in this configuration, make sure you assign the surround back channels to bi-amp in the amp assign section of your receiver or pre-amp in order to get a second front channel signal sent to the speakers. At Aperion Audio we have an informal motto of “trust your ears”. So now that we have gone over the benefits and types of bi-amping, it’s time have some fun and test things out to see what we can really hear for ourselves. For this test, I went with a horizontal, passive bi-amping setup with my Marantz SR7005 and Verus Grand Towers, using runs of 12 gauge copper strand wire. The Verus Grand Towers were the first edition and one little side note of personal bragging rights, these are some of the first Verus speakers we ever made. I used Pink Floyd’s Money as this has long been one of my reference tracks, it’s a remarkably balanced recording with strong bass, well defined vocals and I particularly like that it has a saxophone solo to help test out a bit different timbre than you get with a typical rock track. I started out listening in a typical configuration and then moved to the bi-amp set up and then went back to the normal two channel one more time. There was a discernible difference, with the bi-amp connection having a more open and airy sound and a bit more heft to the bass. I think the Verus Grand Towers definitely were given more of a chance to shine with the added power. Was it a night and day difference? Well, no, honestly in both configurations it sounded fantastic and I would be very happy with the speakers if I left them just hooked up to a single channel each. However, I have moved my SR7005 out to my mancave, or “the studio” as I call it, where I only listen to music and there is no TV. Because of this, I am going to go ahead and leave them in the bi-amped configuration. I could hear a difference and there really is no reason for me not to use the bi-amp feature. The bottom line is if you have the two extra channels available in your receiver or amp and you have speakers that support bi-amping, then I would recommend hooking them up in this configuration. It certainly won’t hurt anything and I think you will hear at the very least a modest improvement in your speakers’ sound. We hope you found this brief guide to bi-amping helpful, feel free to leave any questions in the comments and happy listening! Passive bi-amping doesn’t double the power. The voltage from both amps is the same. The speaker impedance determines the current and the power. Since the impedance of one speaker is divided between two amplifiers, the current and power that would be supplied by one amplifier is divided between two amplifiers. Twice the power is available, but the power produced and used is the same as the power of one amplifier. Twice the power is only produced and used if you connect a pair of full-range speakers to each amplifier. texto muito positivo, bem claro.